The Jews of Jesus day claimed to be the children of God by virtue of being the physical descendants of Abraham, even though they were not the spiritual descendants of Abraham. Meanwhile, Christians, including both Jews and Gentiles, are not all physical descendants of Abraham, but they are his rightful spiritual descendants. The Papists of Calvins’s day claimed to be the Church of God by virtue of direct succession from the apostles and fathers, even though they were not the spiritual descendants of the apostles and fathers. Meanwhile, the Reformed do not necessarily come in direct succession from the apostles and fathers, but they are their rightful spiritual descendants. 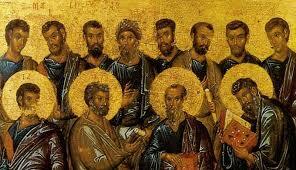 His point: Spiritually speaking, it is not the Papists who can claim true apostolic succession, but the Reformers.